Crystal Clear Finish - No need for anymore ugly rubber or foam! Our corner guards are clear and transparent once applied to a clean surface. You won't even notice they are there! Allowing you to keep your toddler safe, whilst keeping the natural beauty of your home. Simple Installation - Baby proofing your home has never been so easy! Our user friendly and quick installation guide is included. Remove covering and stick, it's that simple. Our super strong adhesive comes pre-applied which means your babies are instantly protected! 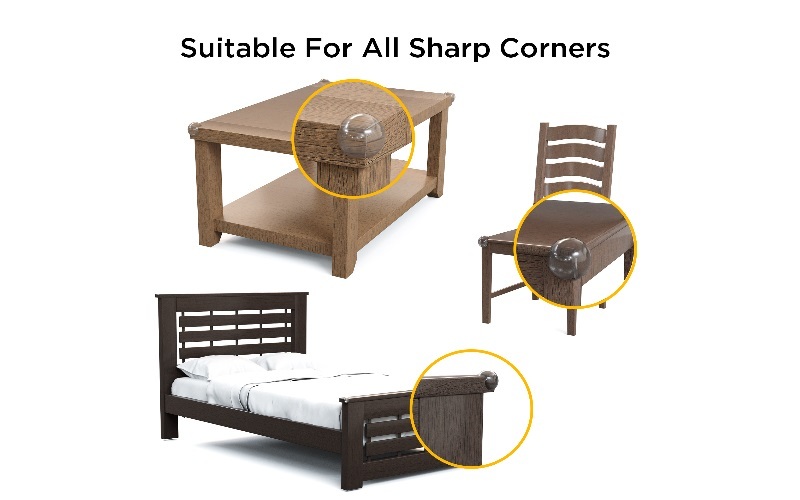 Baby corner guards can also be removed without leaving any marks behind. No More Worrying - With sharp edging around every corner, furniture is always a hazard for your children. Our baby corner guards are a perfect solution to protect your babies whilst playing in your home or office. Suitable for kids at any age, even the sharpest of corner are no longer a hazard. it's baby proofing at its best! Manufacturer Guarantee - Our corner guards have been made with the highest quality materials to meet our extremely high standards. We are backed by our manufacturer guarantee and offer 100% customer satisfaction, no questions asked! Your little ones are guaranteed to be safe when you've invest in Safe And Sound KiddyCare corner guards. Is your furniture a hazard? With kids constantly on the move and sharp furniture around every corner, you can sit back and relax when your corner guards are installed. 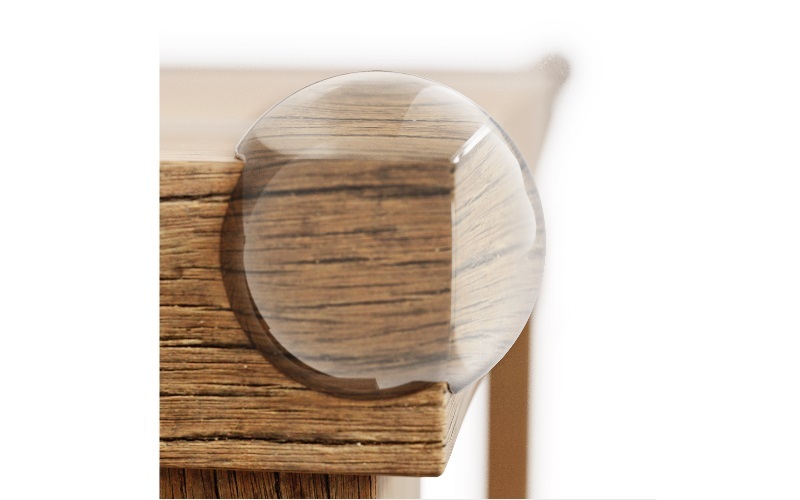 Our ball shaped protectors are a perfect, modern way to protect your children whilst playing in your home or office. 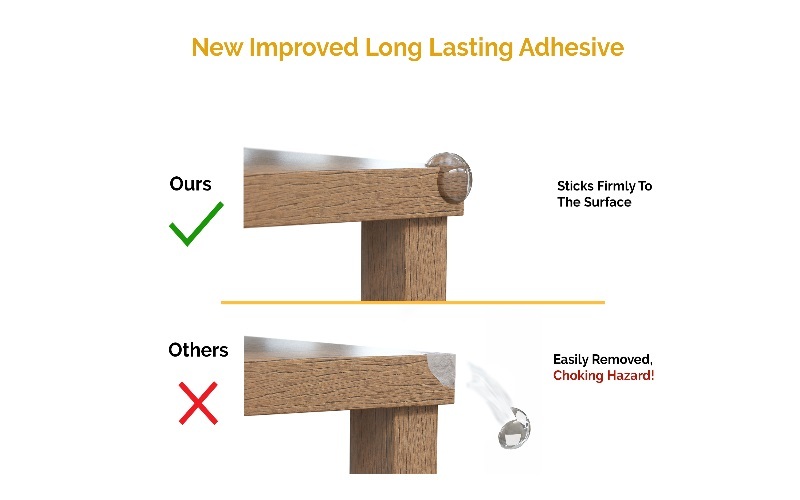 With our extra hold 3m adhesive makes it near impossible for a child to remove, but easily and safely removed by adults without damaging your furniture. With pre-applied adhesive ready to install for instant protection, our step by step installation guide is included in our packaging. Determine where to install, remove adhesive and stick, it's that simple. Protecting your babies whilst keeping the natural beauty of your home is easily done with our corner protectors. A 100% transparent finish when applied to a clean surface, your children are protected without you even noticing. Every year over two million kids under the age of 15 suffer from unexpected mishaps inside the home, which can result in them being brought to emergency units or hospitals. Don't let your family become part of the injury statistics. We are backed by our manufacturer satisfaction guarantee, if you are not 100% satisfied with our corner guards, we will replace or refund your order, no questions asked!